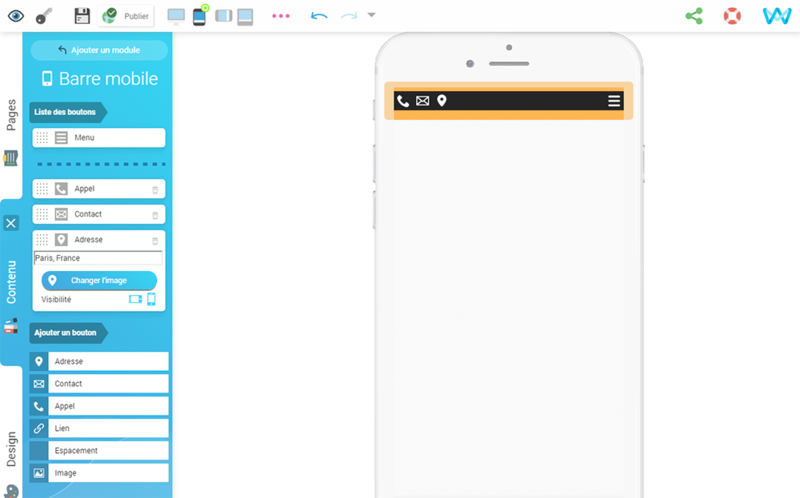 SiteW gives you even more customization options for your mobile website design: you can now add a GPS to your mobile website menu, in only one click. This can be very useful for tourism and accommodation websites (guesthouse, hotel, b & b, campground…), and also for retailers' online shops, or even for event websites (wedding, birthday or anniversary websites…). What does the GPS option consist in? This new feature allows you to add an icon to the navigation bar of your mobile website, and thus to display a GPS map with a location pin, in only one click. When your visitors click on the icon, this directly opens the GPS application (GoogleMap for Android and Maps on iPhone). You have the possibility to add several GPS icons, according to your needs. This feature is only available for Premium and Pro users. How to add the GPS option to my mobile menu? In the blue panel on the left, click on the Address button. The GPS icon appears and you can configure it, by entering the desired location into the ‘Text’ field. Finally, you can check the address displayed, by clicking on the icon, then on the notification link (or by visiting your website in mobile view). And voilà! You have at your disposal a new handy feature, that will make your visitors’ life easier and that will allow you to highlight your products and services. Update your website!